In his seventh aviation history book, Bruce McAllister brings together the largest collection of photographs of the world’s most legendary aircraft–the DC-3. The book’s release is timed to the aircraft’s 75th anniversary–hundreds of DC-3s are still in service today, almost 75 years after the first one rolled off the production line in 1935. 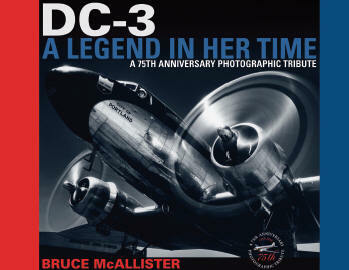 With seventeen chapters covering many of the civilian and military operations in which the DC-3 has participated, McAllister has gathered some 250 high quality photographs from around the world. A rich history surrounds the DC-3. In the 1930s, the DC-3—as the aircraft of choice for the world’s major air carriers—helped spur the tremendous growth in airline travel. In World War II, General Dwight D. Eisenhower identified the DC-3/C-47 as one of the keys to the Allies’ victory. The aircraft even served as a potent gunship in the Vietnam conflict. DC-3: A Legend In Her Time captures this history, bringing this workhorse to life for readers through its particularly dramatic photographs. A series of essays on the dysfunctional relationship between the Federal Aviation Agency and those it pretends to serve. 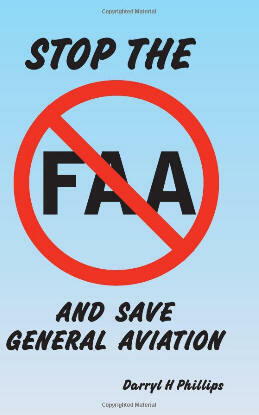 STOP THE FAA examines the agency as it actually affects the pilot, particularly the aviator who flies for enjoyment and pleasure. Violations, arbitrary enforcement of real regulations (and of those that FAA individuals dream up), how to fight them, the harmful effect of FAA's inadequate equipment, the future of Free Flight, all those and more are in this book. STOP THE FAA discusses why personal flight is decreasing in the United States and what we can do about it, Learn why AOPA and EAA work so hard and accomplish so little in the face of the FAA, and suggestions of how to change it. Long a proponent of silent Stirling engines for aviation, the author explores the advantages aviation could enjoy if we quiet our aircraft, and how we can do it. If you are satisfied with the slipping-towards-oblivion status quo in personal aviation you don't need this book. But if you're interested keeping costs reasonable, keeping flying alive for the generations to come, and keeping the FAA from destroying the freedoms we treasure, this is the book for you. Plane Jane is an "edge of your seat” adventure story, full of plot twists and surprises. The aviation scenes are very realistic and the writing will put you right in the cockpit with the characters, flinching as they flinch and ducking as they duck. Plane Jane is a must read book for aviation enthusiasts and for anyone who enjoys a good thrilling adventure. Robert Fischer was raised in San Francisco and currently resides in Sonoma County, California. After serving as a Korean War pilot in the Marines, he went on to work as an import-exporter and as a restaurateur in Australia and California. He also flew his own helicopter, was invited to fly for the Rhodesian Army and flew for a Senator in the Philippines during the President Marcos period. After returning to America, he sold desalination equipment in Arabia, Australia and the Polynesian Islands. Plane Jane, his debut novel, highlights experiences in Bulgaria, where he witnessed wide-spread theft of autos and airplanes from the West. Robert is a dad to five children and a husband to his wife Helga for 30 years. This 271 page aviation-themed adventure follows fictional ex Air Force Major Mary Jane as she seeks to repossess a luxury Boeing 747 from a rich and powerful Saudi Prince. Partnered with another recently discharged Air Force Pilot, Jesus Martinez, Mary quickly finds herself immersed in Saudi Arabian culture and intrigue as her quest takes on twists and surprises. Plane Jane will be released on June 11, 2010 and can be pre-ordered at bookstores everywhere. Release Date: June 11, 2010. Format: Perfect Bound Soft Cover. 5.5" X 8.5" 271 Pages. Price: $14.00. Publisher: Martin Pearl Publishing. ISBN: 0981482244. You can pre-order a copy today at your local bookstore. Flights of Adventure, an anthology of true adventure stories compiled by editors Ken Larson and Tom Holton. Flights of Adventure explores the exciting, often harrowing lifestyles of commercial and military pilots, wingwalkers, passengers and men and women who brave the elements in the most barren places on earth. This collection of true stories takes readers flying in World War II, across North America, to the ice of Antarctica, and over the deserts of Africa. The ten stand-alone stories in this book are touching, humorous, exciting, and often dangerous or miraculous. Flights of Adventure will appeal to women and men, whether aviation fans or armchair travelers across the globe. The contributors to Flights of Adventure provide their unique perspective of this sometimes magical occupation of flying. Wingwalker Carol Pilon routinely steps out on the wings of a low flying airplane where she is exposed to 160 mph winds. - Tom Holton faces a life or death decision while flying over a remote Peruvian town. Should he crash into the jungle canopy or ditch the plane into the Amazon River and risk death by piranha, crocodiles, or drowning? - Paul Derocher explores the bitter cold of Antarctica, flying scientific expeditions into the most inhospitable place on earth. - Ken Larson introduces Golma, a heroic airplane, and her pilot in the east African desert. - Ken Yamada was a non-flying passenger/turned navigator/turned thief/turned survivor on an airplane flight from hell. Sometimes it’s better to be lucky than skilled. Kevin Kasberg, naval officer and aviator, relates his near-death experiences over the Mediterranean Sea. What are the odds? He lost two engines on the same helicopter in one day. "All in a day's work," Kevin tells us. Nick Qualantone takes readers into the harsh landscape and dangers of Somalia as part of the "Blackhawk Down" era, then into the jungles of South America with a top secret organization taking down drug lord Pable Escobar. - Dr. Victor Sullivan built an airplane, the VariEze, in his living room. This was a family project. The plane was a thing of beauty and grace until a most fearful flight. - Olive Sullivan, Victor's daughter, takes a humorous look at life with a father obsessed by airplanes as she talks about women who love men who love airplanes. - Marion Hodgson, one of the first women in the WASP program during WWII, describes winning her wings and coping with men who didn’t believe women should fly planes. Details about this exciting book follow. More information is available online at www.flightsofadventure.info The book is available for purchase online at all major book sellers, including Barnes and Noble, Amazon and from the publisher. 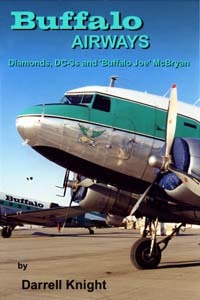 Diamonds, DC-3s and 'Buffalo Joe' McBryan...is a personal memoir, a 'phoenix' rising from the ashes of memory after having flown with the most unorthodox airline in the world, owned and operated by the enigmatic 'Buffalo Joe' McBryan. The book tells a story of how vintage, seventy-year-old warbird freighters were reconstituted to face the challenges of operating over uninhabited regions of the north in extreme, subzero temperatures...without benefit of hangars, modern equipment or airfield infrastructure. The book graphically details how aircraft simply disappear in the north while on routine charters, how crewmembers were forced to effect repairs to complex aircraft with little more than skinning knives and tape, and how DC-3 freighters - mounted with 500 pound skis beneath each wheel - were routinely landed on remote frozen lakes high above the Arctic circle without weather reports, communication, receiving crew or even a windsock, and often at night. About the author - Knight was born in Calgary in 1957 and raised in a mixed farming district north of the city. At age seven, he took his first plane ride with an uncle who owned crop dusters, and from that day on Knight was hooked on flying. During high school Knight won gliding and flying scholarships while serving in an Air Cadet squadron, which led to seven years of decorated service with the Canadian Forces. Knight travelled extensively, resided in Europe, Israel, Central America and Alaska. Knight was educated at Grant MacEwan College and the University of Calgary. He flew with Buffalo Airways in the Canadian arctic. Now in retirement for ten years, Knight has published four great books. Knight spends his time between writing at his home in Calgary, and building a retirement home on his farm in Bowden, Alberta. The whole family will enjoy watching a well put together documentary. 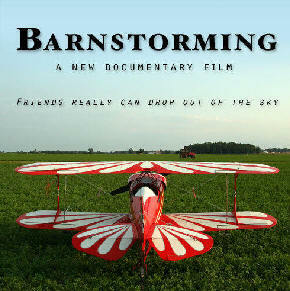 Barnstorming is the true story of an unexpected friendship that developed between a farm family and two pilots who literally dropped out of the sky. Their friendship has created a new tradition out of an old one long gone: barnstorming. Barnstorming captures their annual gathering: the visceral exhilaration of flight, the anticipation of the barnstormers arrival, and celebration of the reunion. Shot in real time, and told in the participants' voices, the film immerses the viewer in the innocence of earlier times, the fleeting nature of childhood, and the joy of friendship. It is a testament to our ability to connect as human beings, no matter where we come from, or how we get there. Directed by Bryan Reichhardt, Co-director of photography Mark Betancourt, Original music by Suzanne Brindamour, With Support from the Alfred L. and Constance C. Wolf Aviation Fund. You can find this video at barnstormingmovie.com The video is not expensive it's only $19.95. We know you will enjoy the movie.